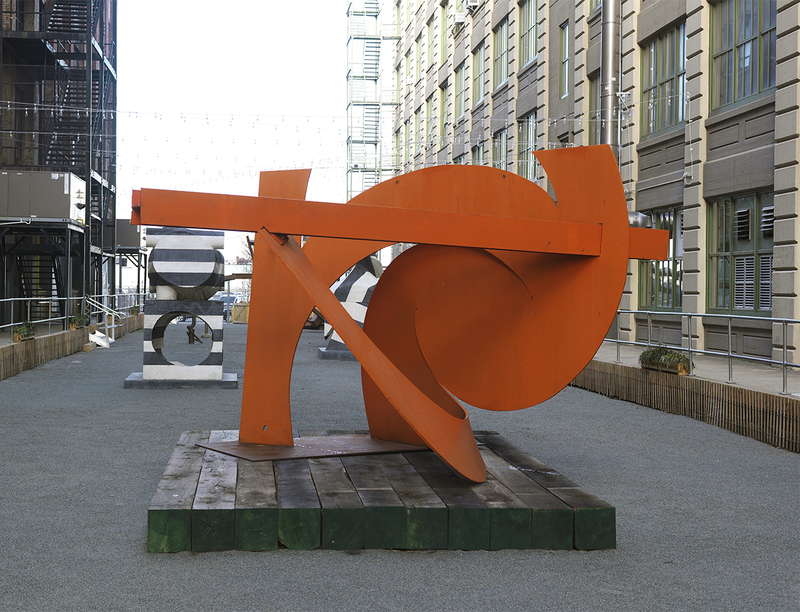 Last seen on Governor’s Island in 2012, Rust Angel (1995) found a temporary home in the courtyard of Industry City in the fall of 2013. The vermillion red, painted steel structure is almost nine feet tall and over fourteen-and-half feet wide—a relatively small sculpture when compared to di Suvero’s other works. Made from one plate of steel that was cut with a torch into an intricate configuration of loops and shapes, resembling a paper cutout, the structure surprisingly has an overwhelming sense of weightlessness and fragility. Anchored by an h-beam that cuts through part of the steel sheet, and perches on the end of one spiraled steel leg, it is also held together by steel wire that is attached to the other side of the structure. Without the dense, mechanically fabricated steel beam, the rest of the sculpture seems almost like it could fly away at the touch of the slightest brisk wind. Mark di Suvero, “Rust Angel,” 1995. Painted steel, 8′ 11 x 14′ x 7′ 8″. Courtesy of the artist and Paula Cooper Gallery. Photo by Brian Buckley. By their very nature di Suvero’s sculptures undercut their obvious industrial features by focusing on form and style to create amorphous, and anthropomorphic structures (di Suvero has described Rust Angel as “a very elegant moment like what an archer does when they [sic] draw their bow”). In this way the gestalt of each monumental structure is akin to that of the body, and the landscape—a dialectical relationship between both synthetic and natural forms. Di Suvero’s work wants to rid itself of all industrial leanings and focus our attention on its shape and connections to nature, while also suppressing its machinistic corporeality—a tension that is brought to life by the master sculptor himself.